Bring Wolfgang Puck's signature tastes into your home. 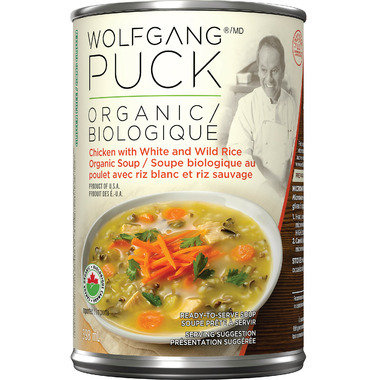 Wolfgang Puck's Organic Chicken with Wild Rice Soup is a restaurant-quality premium soup made with the finest all-natural ingredients, USDA certified organic. The soup is made with free range chicken together with savory stock, organic white and wild rice, vegetables, and the perfect blend of herbs and spices. Ingredients: Organic Chicken Stock (Water, Chicken Meat [Certified Organic Ingredient] and Natural Juices [Certified Organic Ingredient], Salt, Cane Sugar [Certified Organic Ingredient], Maltodextrin [Certified Organic Ingredient], Natural Flavor, Dried Onion [Certified Organic Ingredient], Potato Starch [Certified Organic Ingredient], Dried Garlic [Certified Organic Ingredient], Turmeric [Certified Organic Ingredient], and Spice Extractives), Organic Carrots, Organic Cooked Chicken Meat, Organic Celery, Organic Wild Rice, Organic Potato Starch, Organic White Rice. This product cannot be shipped to Remote locations. This soup is average canned soup. It is not particularly special, and it is really not special considering the price. There are better organic soups with a higher density of ingredients. I will not be buying this product again. Best gluten free chicken soup. Wolfgang Puck makes great soup! It's just a tad on the salty side for me and I wish there were a few more carrots, but very good! One of my go-to soups with being dairy-free and gluten-free. I also like that organic chicken is used. This is a great 'grown up' chicken soup, especially when you have a cold and don't want to force down a can of Campbell's salty grossness. My biggest tip for this soup is please hear it on the stove instead of in the microwave. The rice and chicken are way more tender when heated gradually on the stovetop. It's a totally different experience with stovetop vs. microwave. I've already said how much I love these soups, and must say I only have myself to blame for me next statement. I "assuming" organic meant organic/safe of additives, did not read the label on most of these soups the way I should have. For years, because of having low blood sugar, I've avoided eating anything with Maltodextrin in it, some people say it's not MSG, but it causes my blood sugar to drop, neither people with low blood sugar or diabetes should eat this. Sadly these deliciously made soups have Maltodextrin in them, the only one I've found without it is the tomato/basil. I'm quite upset about this, as I was and have ordered a lot of it to eat when I can not cook. These things do not have to be in our food and if we don't complain they will keep putting them in there. While loving all Wolfgang Puck "organic" soups, this is my favorite and just today ordered SIX more cans. Haven't found this soup anywhere else on or off line, thank you Well.ca for introducing us. All the Wolfgang soups I've tried so far beat Amy's on both flavor and price, I'm a real dedicated soup person and totally in love with this flavor, coming with both organic white and wild rice, and the richest broth I've tasted out of a can. PLEASE carry more flavors, just got more of this flavor and had it for lunch today. Keep up the good products and the best service online.